A calzone is a folded pizza, usually shaped like a half-moon and stuffed with cheese and possibly vegetables, meat, and/or sauce and it can be baked or fried. It is often served with marinara or pizza sauce on the side. The dough used for a calzone is a yeasted bread or pizza dough, so the first step is to prep your dough. Make pizza dough from scratch or use one that is store-bought. You can also use whole wheat dough, or dough flavored with herbs or other seasonings. No matter what type of dough you choose, let it sit at room temperature for a half-hour to an hour in an oiled bowl loosely covered with a towel. While you wait for your dough to rise, you can prepare the filling. Classically, calzones are filled with cheese--usually a soft cheese like ricotta--along with mozzarella. Then other fillings are also added. After the veggies and/or meats are cooked, mix them together with the cheeses and any seasonings you like. Set aside. Preheat the oven to 500 F. If you're using a ​pizza stone, place it in the cold oven and heat it as the oven heats. After the dough has risen, punch it down and then divide it into two balls. Place one ball onto a well-floured surface. Stretch or roll the dough out to ​an oval or circle. It should be about 1/4 inch to 1/2 inch thick and about 10 inches to 12 inches in diameter. Repeat with the other ball. Place half the filling onto one side of each dough round, leaving about 1 inch of space around the edge. For each calzone, lift the side of the dough without filling and gently pull it across to the other side, creating a half-moon shape over the filling. With wet hands, press the edges shut, or use a fork to crimp. 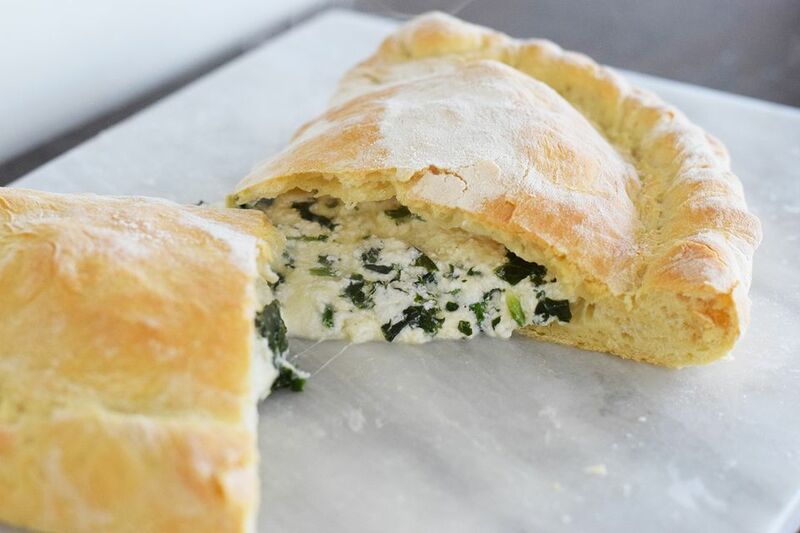 Place calzones onto a cornmeal-sprinkled baking sheet. If you are using a pizza stone, you can place the calzone onto a pizza peel, which is a shovel-like tool used to slide the pizza in the oven. Transfer the calzones to a pizza stone with the pizza peel. Or, place the baking sheet into the oven. Bake for 12 to 15 minutes, until the crust is golden brown in spots. 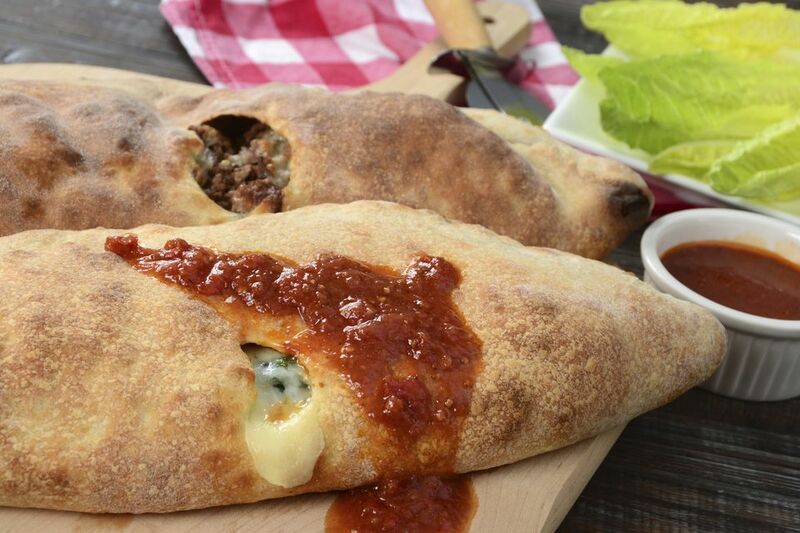 Remove the calzones from the oven and serve them with your favorite marinara or pizza sauce. Allow cooling time as the stuffing will be very hot. If you want, you can also try deep-frying your calzone, which is a regional specialty made in Puglia called panzerotti. These are usually made with a thinner dough and are somewhat smaller. It's similar to deep-fried pizza.